This book is the perfect read for fans of Stranger Things or Wayward Pines. There are some seriously strange things going on in this small town, and Reichs has interwoven all those mysterious happenings into a plot that is captivating and utterly unpredictable. I paired Nemesis with this Baron Von Nemesis Shiraz. 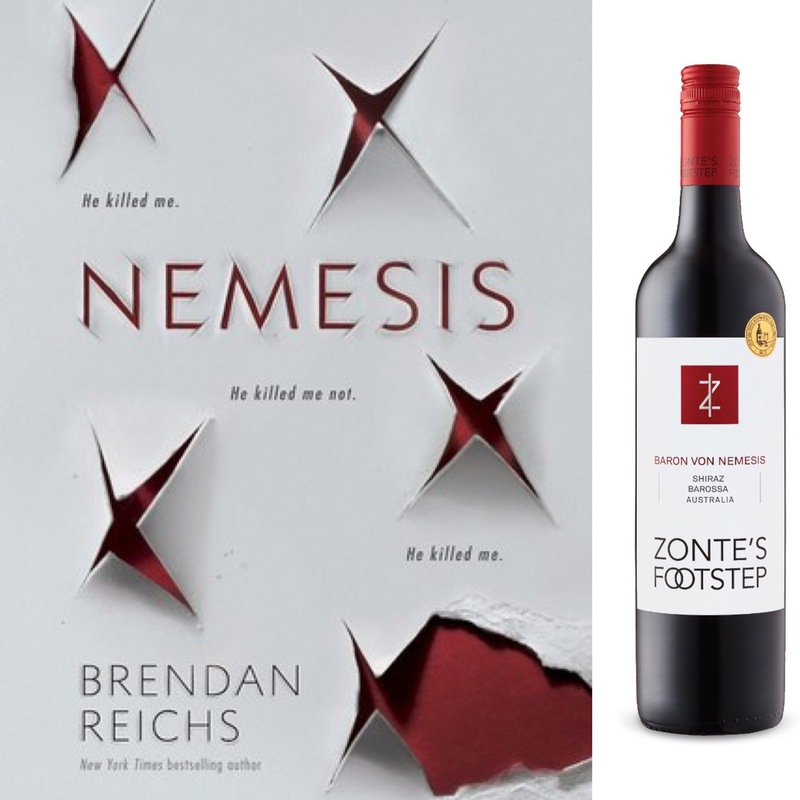 Not only because of the word “nemesis” and the fact that the label looks amazing with the book cover, but also because this wine is intensely flavored with some spicy notes in the background, and this book has one intense plot with a whole lot of intrigue going on behind the scenes. This is a truly great mystery. Reichs does a phenomenal job at creating several different mystery elements in his plot and then weaving them all together in a way that you’ll never see coming. The pacing of the story is brilliant. Reichs introduces each new thread to the overlying mystery at just the right moment, so that as a reader, you’re constantly being drawn further and further into the story while trying to figure just what the heck is going on. The multiple POVs are handled wonderfully. Each character has their own very unique voice and backstory. Reichs also flips POVs at just the right moment. He doesn’t let you see too far into one character’s POV and story, so you can never quite figure out what’s going on. The backstories of each of the characters intermingle perfectly and add layer upon layer of intrigue to this plot. I loved both Min and Noah as main characters, and I loved that they were so different from one another. Min is brave and smart despite her circumstances, while Noah is more cautious and anxious because of his. I loved how Reichs used these two characters to explore the idea of how two people can have the exact same terrible thing happening to them, and how differently that thing can affect each of them. The setting is also fantastic. There is definitely something to be said about setting a mystery in a small town. I think it’s the fact that in a small town, you feel like you know everyone, and discovering just how much you don’t know about the people you think you know is so fascinating and terrifying at the same time. You couldn’t choose a more perfect location for a conspiracy. Plus having it set in small town surrounded by woods and wilderness ups the slightly creepy vibe going on here. I will admit that I wasn’t quite as engaged with the romantic elements of this story as I wanted to be, which is largely due to the fact that the focus of this book is so much on the plot, which is masterfully done. There are just a couple scenes that would have packed more of an emotional wallop if I had been more engaged with the romance. This book is definitely one of those books that transcends that barrier between adult and young adult fiction. I think readers of all ages will be equally entertained by this, and I think that this is the type of story that is destined for a television show. Also, please be aware that this book is part of a series. I’ve seen a couple negative comments on reviews regarding the ending, and I think that’s mostly due to the fact that it isn’t widely advertised that this is part of a series. Know that going in, and you’ll be able to appreciate how awesome the ending really is! This cover is gorgeous in its simplicity. I love the contrast between the white and red. I also love that just looking at this cover pulls you into the mystery. You just look at it and start to wonder what is going on in this book? What do those rips symbolize? Born and raised in Charlotte, North Carolina, I attended the public school system as a proud Myers Park Eagle, Carmel Cougar and South Meck Sabre. I had many great teachers along the way, to whom I owe eternal thanks. Then I packed up and headed to Wake Forest University in Winston-Salem, NC. When they finally handed me a degree — a B.A. in History, the most practical of all undergraduate studies — I moved to DC, and three fun years later, enrolled at The George Washington University School of Law in Foggy Bottom. Upon graduating from law school, I felt the siren call of home and returned to Charlotte, dragging my Boston-bred fiancé along with me. After three long years working as a litigation attorney, I abandoned the trade to co-write the Virals series (Virals, Seizure, Code, Exposure, Terminal, and Trace Evidence). This is not a decision I regret. I continue to live in Charlotte with my beautiful wife, mischievous son, and beautiful daughter. We also have a playful pit bull mix named Soldier, and two ferocious cats, Fenway and Wrigley. It’s a full house. No complaints. We’ve completed the fifth and final book in the Virals series, Terminal. I really hope you like it. A Virals short story collection, Trace Evidence, released on February 2, 2016, with a brand new story, SPIKE, set after the events of Terminal. Answers await! And I’m happy to announce a new two-book deal with my friends at Putnam for my solo YA series, NEMESIS. Look for it in Spring 2017! Very. Excited. Check out my blog for a teaser of the story. I’m also on the Executive Board of both the YALLFEST and YALLWEST young adult literary festivals. These are a good time. Please join us in either sunny Charleston in November or even sunnier Santa Monica in April. I plan to keep on writing novels until they drag me kicking and screaming from my desk. Welcome, friend. Have you read Nemesis yet? If so, did you like it as much a I did? Have you read any of Reichs’s other books? Thanks so much! I think you would definitely like this book then. I had a lot of different theories about the ending, but it definitely turned out to be something totally unexpected for me! That’s what I’d heard about it too honestly. I don’t watch a lot of television, because TBR pile. LOL. But I probably won’t watch that one. I am definitely excited for you to read this book though! I can’t wait to hear your thoughts on it. Good, then I’m glad I won a copy of this one! I’m definitely going to keep it! Oh, that’s awesome! Can’t wait to hear your thoughts on this one. I think we have similar taste…so if you like it, I’ll like it too! Did you like Long May She Reign? I just finished it and I wasn’t a big fan…. I haven’t read it actually. I really wanted to, because standalone fantasy, but I just haven’t made it to that one yet. Amazing review…as always! I will admit that I wasn’t all that interested in Nemesis until seeing your review. I have been seeing this novel on various forms of social media all this week, but I never took a closer look into the story. Nemesis actually seems like a pretty good book and I like a lot of the aspects of the story & setting that you mention in the review. I’m looking forward to reading this in the future. Happy Reading! Oh, thank you! I’m so glad to hear that. I hope that you like it as much as I did when you do get around to reading it. It really is just such a neat book. I did not know this was a series, but I don’t think that will stop me from reading it. The premise sounds very unique and interesting. I didn’t either going in. I’m the weirdo who loves waiting for books to come out, so I love starting series with book one. The idea behind this book is phenomenal, and the story itself definitely lives up to the premise. I’m so glad that I got to read it. You’ll have to let me know what you think! I knew he wrote a series with his mom, but I didn’t know that she was the lady Bones was based on. That’s awesome. Oh wow great review ! I kept seeing this book everywhere but the cover didn’t really draw me in to read more about it. But your comparison to stranger things intrigued me. I’m excited to read this! I HIGHLY recommend this one if you like thriller or mystery novels. It’s such a neat book and a really unique concept.